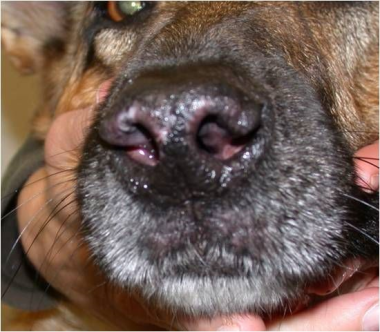 This dog has discoid lupus erythematosus (DLE), an immune-mediated skin disease, often restricted to the nose and muzzle. 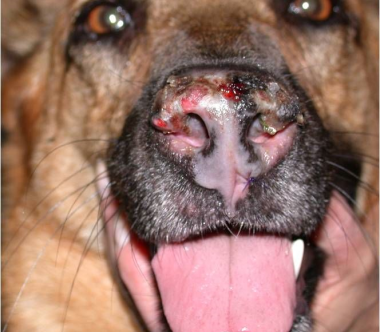 Loss of pigment, erosions, and scabs are common findings with this disease. Diagnosis is made with a skin biopsy of the affected area. A veterinary dermatologist receives specialized training to recognize and diagnose this and other similar skin diseases. This knowledge allows the specialist to select the best area for biopsy to confirm the diagnosis.